It's been cold, dark, dismal - it's January! In a strange way, I am rather enjoying it. It gives me the excuse to indulge in those little cold weather comforts, like hot chocolate for example. I really recommend sweet freedom CHOC SHOT Liquid Chocolate as a healthy option (low calorie, low fat, low saturates etc). Then there is the pleasure of wearing lovely, soft, warm accessories. 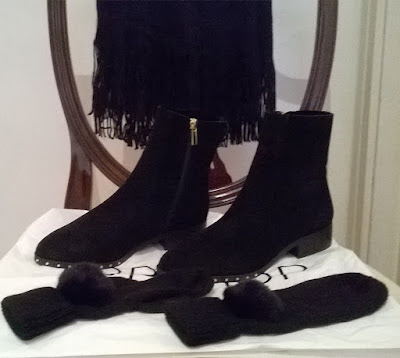 black mittens in a soft wool and polyamide knit, prettily trimmed with faux fur pom-poms, from H&M. Today, it's bright outside, even though it is still cold, so perhaps it's time to start thinking about Spring? Exciting new make-up collections for the new season are out on display on the beauty counters and I am looking forward to the designers presenting their Spring/Summer 2018 haute-couture collections soon (always a good source of inspiration).